As many of you may know, I am WAY behind on my reviews. I thought I might make some attempt at catch-up by starting at the most recent dinners and working backwards. 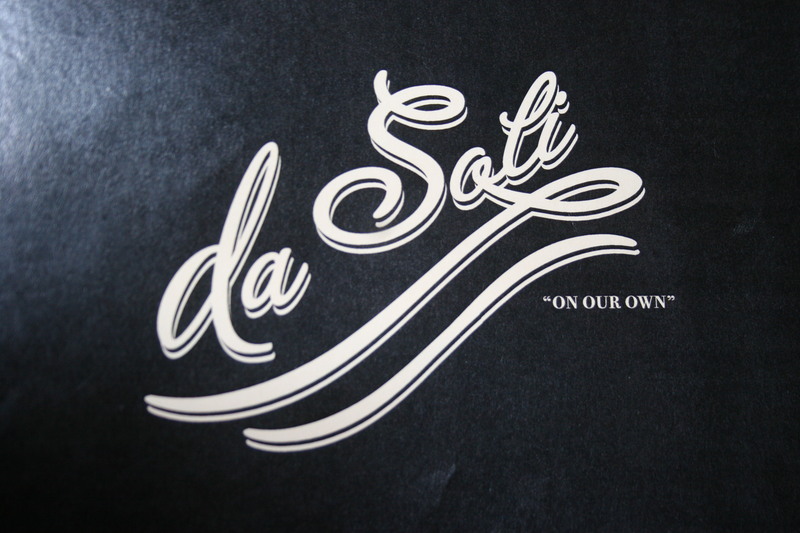 That being the case, eight of us had a very nice dinner on Friday evening at a BYOB in Haddonfield, NJ called Da Soli “on our own”. Da Soli is located on Kings Highway in an area titled “The Shops at 116 King’s Highway”. You may surmise by the name of the shopping area that the address is 116 and you would be correct. The restaurant itself has two levels and features dark wood paneling around the upper balcony. 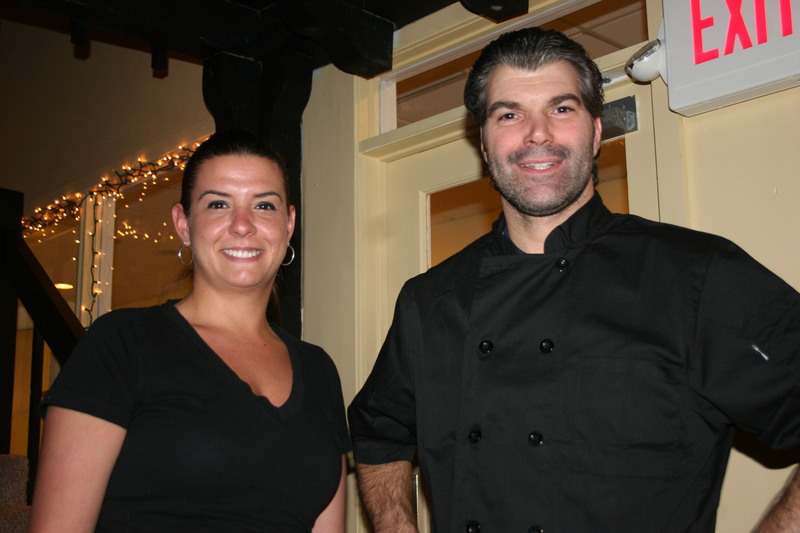 The Chef/Owner is Mark Berenato, who most recently could be found turning out fine meals as the chef at Tre Famiglia. Da Soli offers farm fresh ingredients with unique preparation and presentation. On Mark’s left is our server for the evening, Lauren, who was both cheerful and capable. After a short wait as they prepared our table near the front window we were seated. Our wines for the evening consisted of my 2009 Educated Guess, Napa Valley, Cabernet Sauvignon, this one is mixed with small percentages of Merlot and Cab Franc and although priced at under $20.00 in many South Jersey stores, can always be counted on to deliver great flavors of cherry and blueberries with hints of vanilla. 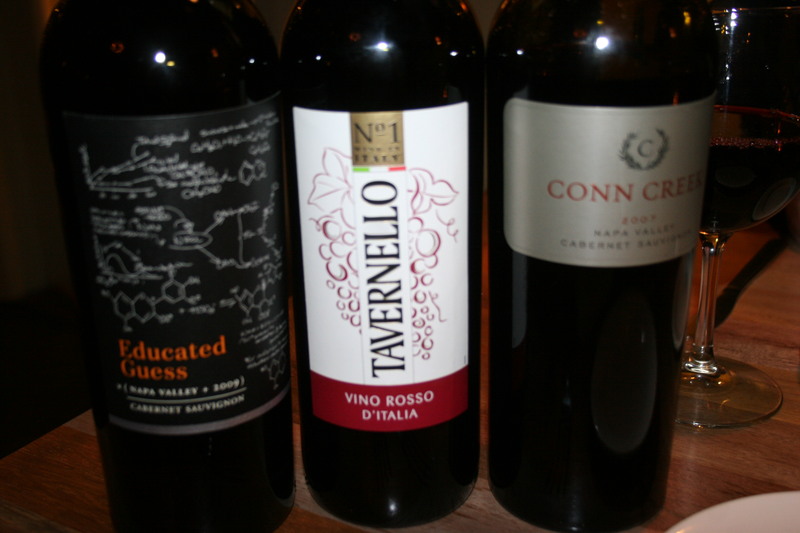 Gerry had an undated Tavernello, Vino Rosso D’Italia which id did not taste and Joe had a nice 2007 Conn Creek, Napa Valley, Cabernet Sauvignon. 2007 was stellar year for cabs in Napa and this one was very good with lots of plum and other dark fruits with a nice smooth finish. The menu items at Da Soli are interesting and slightly provocative. I opted as an appetizer for one of the evening specials which was called “Not Your Grand Mother’s Meatballs” These were certainly NOT my grand mother’s meatballs, or even my mother’s meatballs. 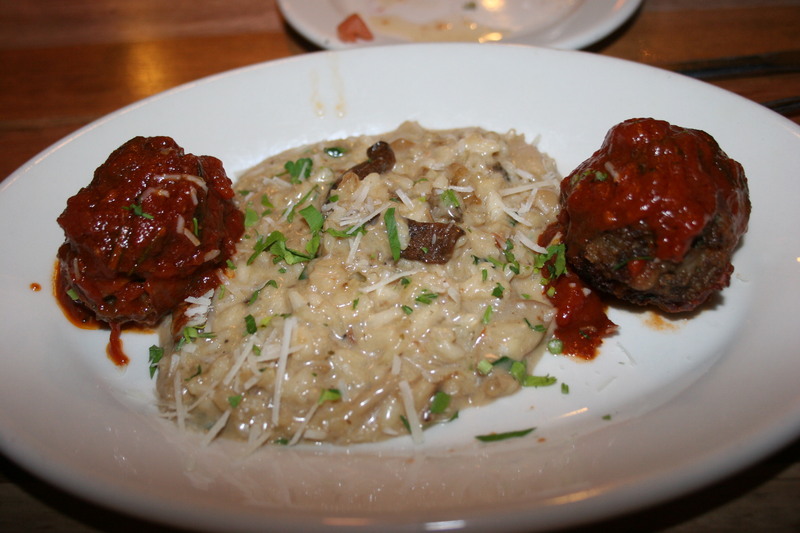 The dish featured two nice sized spheres of pork and veal in a rich red sauce and served with a very tasty Porcini mushroom risotto. Although I almost NEVER eat anything with mushrooms (I have no idea why that is) this proved an excellent pairing with the meatballs. Joe and Carol had a soup featuring white beans, sausage and broccoli rabe and after Joe had his reheated they both thought the soup was very good. My wife, Kathy, had a crab bisque which she also enjoyed. 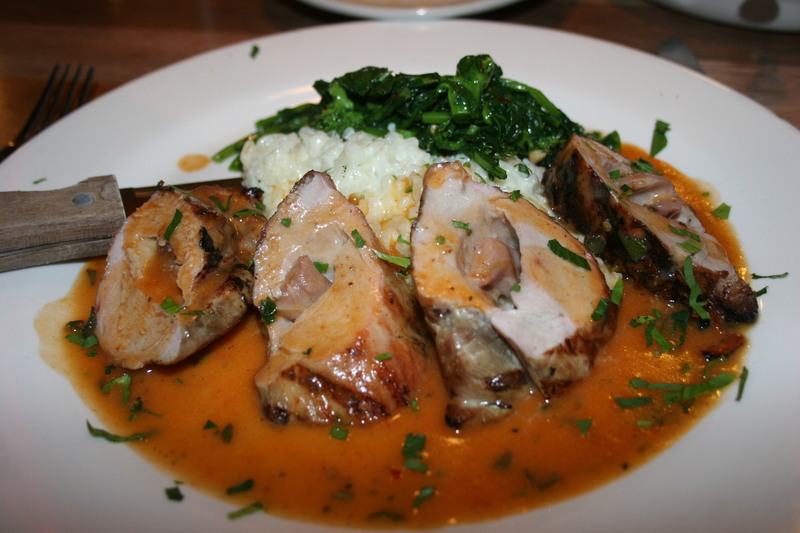 For my entree I selected the Maile Griglia, grilled pork tenderloins stuffed with prosciutto in a rosemary demi-glaze with classic risotto and broccoli rabe. The meat was cooked as I had requested and the dish itself was bursting with flavor. Joe had the same thing and he too thoroughly enjoyed it. Sue had my meatball dish as an entree and she thought it was very good. 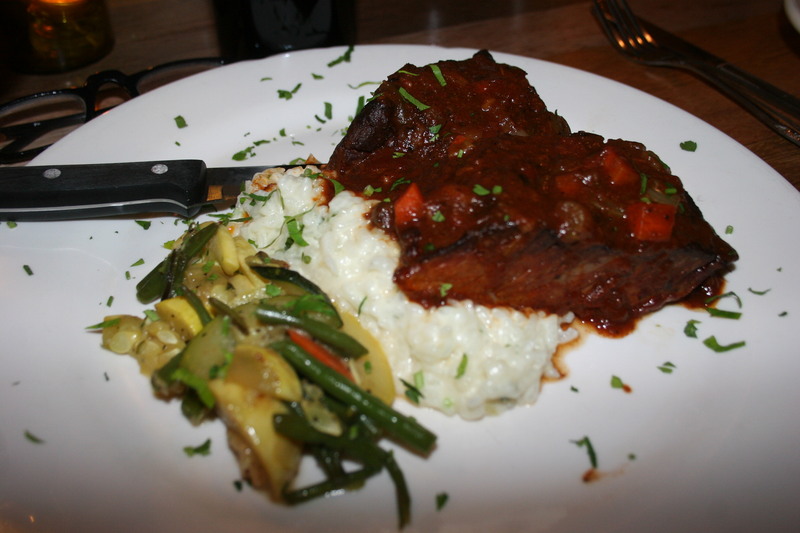 Kathy and Carol both went with the Boneless Beef Short Ribs, slow roasted, fresh herbs, barolo red wine pan sauce and creamy aborio risotto. They both enjoyed their choices. 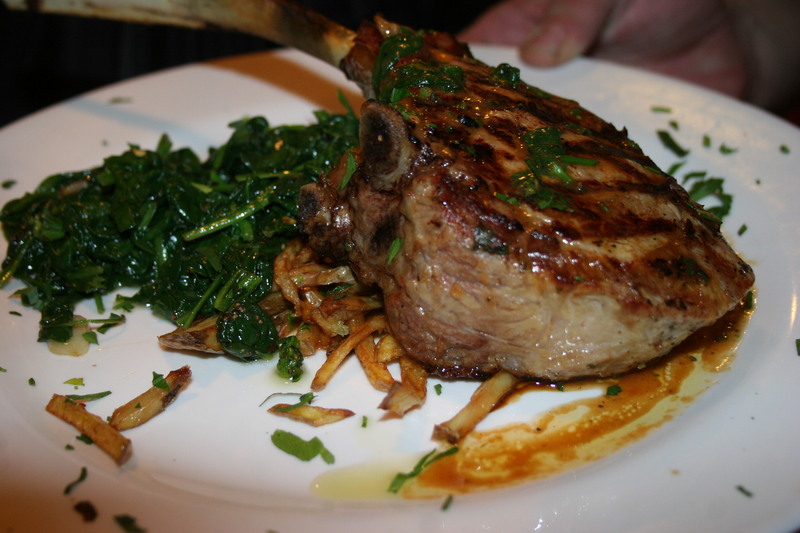 Gerry had one of the specials, a House Cut Lamb Chop that was very juicy and accompanied with broccoli rabe and some Julienne style potatoes. I don’t think we had expected to have room for dessert but as it turned out we surprised ourselves and most of us made the sacrifice and forced some type of selection. I don’t have any pictures but I will tell you that I had the Rice Pudding Gelato and it was scrumdiddlyicious (no, that IS a word, honest). We still weren’t done as mark treated each of us to a little home-made brandy chaser with choices os Espresso flavor or Crazin (cranberry & raisin). Wow, this nightcap would put hair on your chest. Overall, we were all pleasantly surprised. DaSoli delivered good food, nicely prepared in a warm, welcoming atmosphere. We all pretty much decided we would be back in the near future.